Effects of Ultra-High Turndown in Hydronics — R.F. MacDonald Co.
Today, hydronic boilers are producing greater efficiencies than previously thought possible — all due to the advancements of condensing technology. It is the science behind condensing that many people do not take the time to understand, which can lead to misunderstandings and the perpetuation of myths. One of the largest areas of confusion concerns high turndown. Several manufacturers promote ultra-high turndown as the solution to efficiently meeting low seasonal, partial load demands. By understanding condensing boiler operation and the basics of thermodynamics, one will realize that an extremely high-turndown burner on a hydronic condensing boiler does not promote the highest system efficiency but actually can make the system less efficient. The way systems are engineered and operated today varies from the way they were designed in the past. Most heating systems were steam, not hydronic. Steam system operation is very different from a hydronic system, so the two should not be viewed in the same way. Hydronic systems provide many advantages to reduce energy consumption; however they must be operated and controlled properly to ensure a system achieves high efficiency. Below is an example system in which several key factors are presented. Observe the effect each factor plays on operational efficiency. This exercise will help you make an informed decision about proper equipment selection. Selecting the right equipment will provide an efficient, reliable system that has the lowest lifecycle cost of operation. • Turndown comparison = a 5:1 turndown boiler vs. a 20:1 turndown boiler with the same nominal high fire efficiency. It is widely understood that in a traditional steam boiler and with high-temperature firetube hot-water boilers, higher excess air is required at low fire. This ensures clean, safe, stable combustion at lower firing rates but also results in lower combustion efficiency at these rates. Since these boilers are larger and commonly operate at higher firing rates, this was considered a good trade-off. With today’s hydronic condensing boilers, the rules have changed. New premix burner technology has led to the development of burners that provide a proportionate air:fuel ratio across the entire firing range and provides a reasonable turndown. 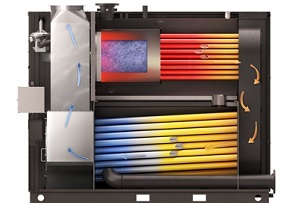 This allows for no loss in combustion efficiency and contributes to an inverse efficiency characteristic, wherein the condensing boiler can be more efficient at low fire rather than at high fire. Moving beyond a reasonable turndown, compromises must be made. The compromise is that excess air must be added at higher turndown to protect the premix burner materials from overheating while still ensuring clean and stable combustion. Remember, during normal combustion, adding excess air reduces efficiency. While adding excess air lowers combustion efficiency, the effects are even more detrimental when operating condensing boilers. Because condensing boilers extract latent energy from the flue gas, we need to look at the impact excess air has on the flue gas dew point. The boiler’s return water operating temperature relative to this flue gas dew point is the most essential factor in achieving condensing efficiency (greater than 90%). As the excess air level increases, the flue gas dew point decreases. A normal excess air level for a natural gas-fired condensing boiler is around 5% O2 (or 30% excess air). This correlates to a flue gas dew point of 127°F. Therefore, in order to begin to achieve condensing performance, the return water temperature must be below 127°F. If additional excess air is added with the goal of improving turndown, notice what happens. By increasing the excess air level as required to 10% O2 (or 80% excess air) in this example, the flue gas dew point now drops to 117°F. 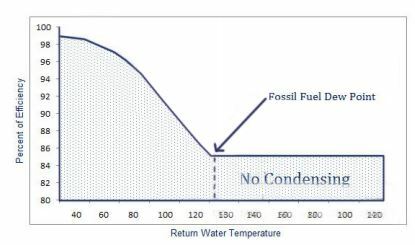 In order to achieve the same level of condensing performance, the return water must be below 117°F. Condensing is the process by which boilers extract the latent heat that is in the combustion gas. So the lower the return water temperature is below the flue gas dew point, the more condensing that can occur and the higher the efficiencies can be. Return water temperature is not the only factor, but does play a major role in the boilers ability to extract the available latent heat energy. Unlike steam systems, hydronic systems rely on mechanical pumping and since the boilers must maintain a constant system supply water temperature, the return water temperature will increase at reduced firing rates. 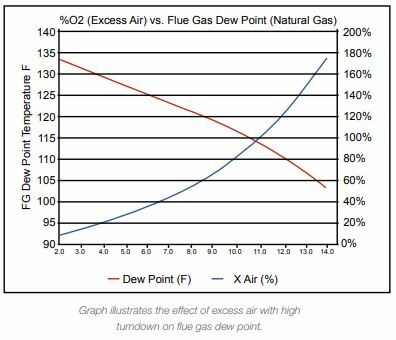 It is critical to understand that excess air must be increased to achieve the ultra-high turndown and the result is that the flue gas dew point is decreased, making it more difficult, if not impossible, to condense. By trying to save energy with the ultra-high turndown burner, we actually move further away from the flue gas dew point, which dramatically decreases a condensing boiler’s efficiency. Let’s take a closer look. • Water flow rate = 75 GPM ° Based on a design of 40°F delta T with the boiler at high fire ° For the sake of simplicity, our example assumes no losses output or efficiency. When utilizing constant speed pumping, the hydronic boiler operating with 5:1 turndown will provide a system delta T of approximately 8 degrees at low fire. Contrast this with the 20:1 turndown boiler where the resulting delta T across the system is approximately 2 degrees. Not only is there less efficient heat transfer with the 20:1 boiler, but the return temperature has been elevated above the flue gas dew point (127°F) and taken the boiler out of condensing mode. Since condensing efficiencies are significantly higher with colder return water temperatures, the elevated return water temperature drops the efficiency approximately a 6%. What effect does this have on the 5:1 operational efficiency? At 5:1 turndown, the return water now comes back at 122°F. The efficiency of the 5:1 turndown boiler at 122°F return water and low fire is approximately 94%. Even though there was an increase in the return water temperature because the boiler remained below the flue gas dew point, it is still condensing and maintaining high-efficiency operation. 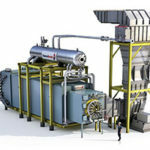 One argument for ultra-high turndown boilers is, “We prevent energy-wasting short cycling by keeping the boiler on.” While valid for larger non-condensing boilers, this argument does not apply to today’s modular systems. Optimally, boiler systems should be designed to cycle no more than two to three times per hour. In practice, five or fewer cycles per hour is considered acceptable. Let’s contrast two scenarios, shutting down vs. ultra-high turndown. The amount of BTUs lost per on/off cycle of the 5:1 sample boiler compared to the loss of idling at 20:1 turndown are substantially less. Taking an average of two cycles per hour and assuming the boiler is off for 10 minutes each cycle, we can calculate, based on the mass of the boiler, pre- and post-purge durations, the water temperature and the BTU loss per on/off cycle. In this case, we calculate approximately 190 BTUs per cycle or 380 BTUs per hour. Rather than cycling off, if we allow the boiler to inefficiently operate in a non-condensing mode, this drop in efficiency equates to 6% or 4,500 BTU/hr. Allowing the ultra-high-turndown boiler to idle for 20 minutes per hour to prevent cycling, actually loses 1,500 BTU’s. The ultra-high turndown boiler has lost four times the energy as the boiler that off cycled twice. 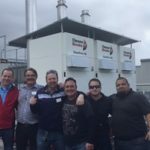 To maximize efficiency, it is important to right-size hydronic boilers for peak and low-load conditions to look at the overall impact the boiler design and control strategy have on the system. Consider adding one or more boilers for several reasons, including redundancy and load matching to provide the correct system turndown. By staging a multi-boiler system, individual condensing boilers can be set to operate at low fire, thereby making better use of the inverse efficiency characteristics. A boiler with a minimum output of 333,200 BTU/hr is an appropriate selection to minimize short cycling while maintaining high system operational efficiency.